Mountain regions cover about 24% of the earth surface and provide important ecosystem services to almost half of humanity around the world. It is estimated that the Hindu Kush Himalaya (HKH) ecosystem alone provide goods and services to about 1.5 billion people living in the mountains and it’s downstream. While the Himalayan ecosystem functions as a life support system, it is also recognized as one of the most vulnerable ecosystems in the world due to climate change and rapid social transformations that are taking place due to globalization. Mountain areas with often difficult terrain and high degree of inaccessibility present a formidable challenge to collect and manage data and information. Earth observation (EO) in combination with the emerging Geo-information and communications technologies, and new innovations provide viable solutions to bridge the important data and knowledge gaps in the region as aspired by the GEO’s vision. 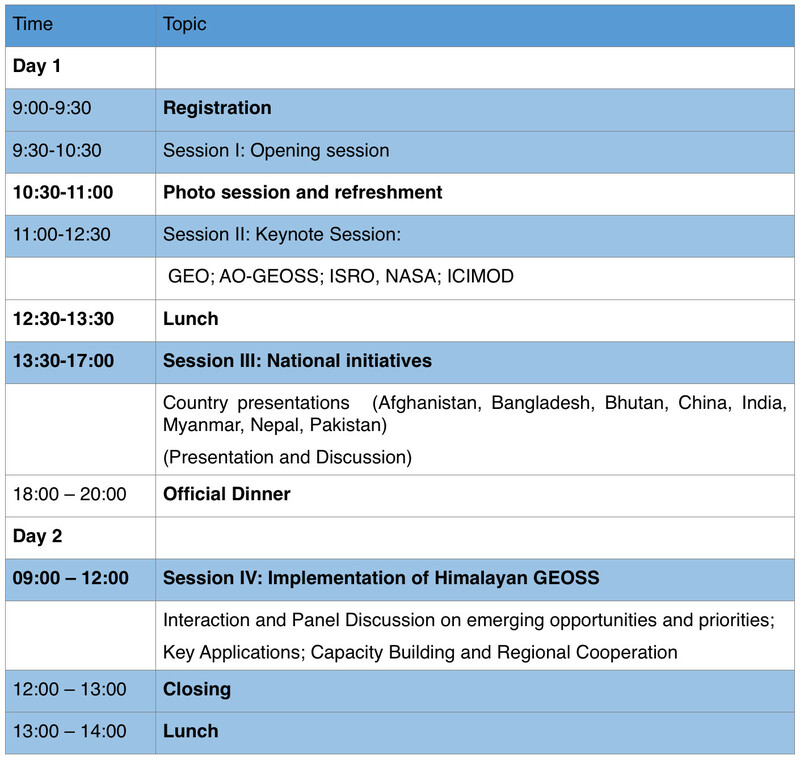 Himalayan GEOSS will develop a platform for regional collaboration by bringing together all the GEO member organizations and thematic line agencies from the region working on EO and Geospatial technologies. International Centre for Integrated Mountain Development (ICIMOD) has become a Participating Organization in GEO and the SERVIR node for the HKH region. SERVIR is a joint development initiative of National Aeronautics and Space Administration (NASA) and United States Agency for International Development (USAID), working in partnership with leading regional organizations world-wide to help developing countries use information provided by Earth observing satellites and geospatial technologies for managing climate risks and land use. SERVIR-Himalaya was established in 2010 at ICIMOD Kathmandu, Nepal. Since then, ICIMOD has been able to draw a significant mileage from increasing interests from international agencies and regional and global level initiatives. Building on these foundations of ICIMOD and its network, ICIMOD can serve as a Himalayan node contributing to the sub-regional implementation of GEOSS with active involvement of the regional member countries and international partnerships. It is expected that activities of Himalayan GEOSS will ultimately contribute to development of SDI in the region through promotion of policy, standards and practices for open access to data, information and services. Therefore, organizing a joint regional workshop on Himalayan GEOSS with all HKH countries and regional and international partners will certainly help on setting up a conceptual framework for Himalayan GEOSS and ensure collaboration and participation from the member organizations and line agencies in the region. This regional workshop aims to provide a platform for policy dialogue and exchanges of technical knowledge focusing on operationalization of Himalayan GEOSS concept and seek inputs and guidance from regional member countries and key regional and international partners. Ultimately, it is aimed to create regional ownership and develop a coherent working paper for the implementation of Himalayan GEOSS in line with GEO next 10-year implementation work plan 2016-25. ICIMOD regional member countries (Afghanistan, Bangladesh, Bhutan, China, India, Myanmar, Nepal, Pakistan), regional space agencies and international partners. The workshop is jointly organized and supported by GEO and ICIMOD.